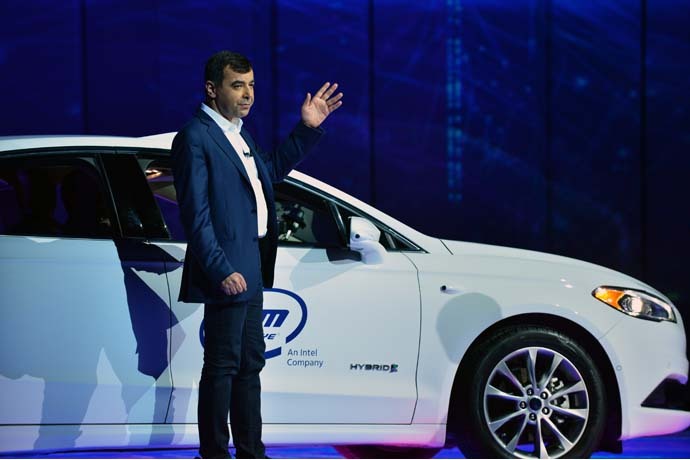 Speaking on the topic of autonomous driving today at CES 2018, Mobileye CEO Professor Amnon Shashua explained that millions of cars hitting the streets this year, simply equipped with a front-facing camera and Mobileye’s new fourth-generation EyeQ® system-on-chip, will play a crucial role in the delivery of a driverless future. 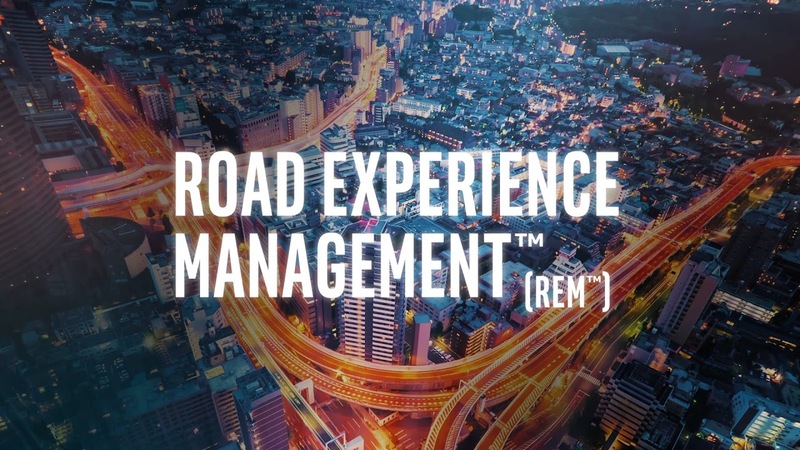 These cars from BMW, Nissan and Volkswagen will harvest low-bandwidth data packets, which will be aggregated in the cloud, thereby enabling creation of high-definition maps through Mobileye’s Road Experience Management (REM™) program. 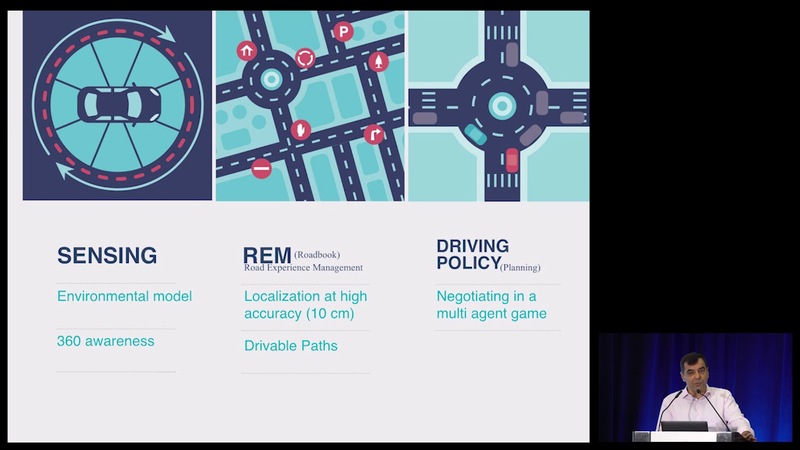 These high-definition maps will eventually play a key role in delivering safe and affordable Level 4/5 autonomous cars, but in the near-term are creating an entire new category called Level 2+. Advanced consumer-targeted systems, which take over the driving tasks under many conditions (on-highway and beyond), have gained significant momentum. Many were included in Mobileye’s 30 ADAS design wins in 2017 and are among Mobileye’s 15 program launches in 2018. 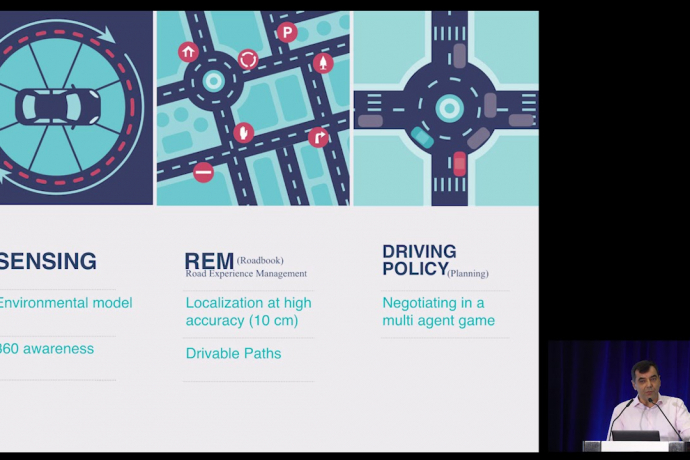 The ability to deliver precision maps at scale and low cost by leveraging the proliferation of camera-based safety systems on cars takes these systems to a new level at an affordable price. Overall, Mobileye has design wins for advanced L2+ and L3 autonomous systems with 11 automakers who collectively represent more than 50 percent of the auto industry – designs that will launch this year and in 2019. Through ADAS technology today, and fully autonomous technology tomorrow, cars are poised to become the greatest data conduits on the planet. As Intel CEO Brian Krzanich noted in his keynote address and Professor Shashua echoed today, the ability to leverage the coming flood of data is critical to the eventual deployment of driverless cars at mass scale. Together, Intel and Mobileye have the strategy, resources, products and design wins to address this coming data challenge. 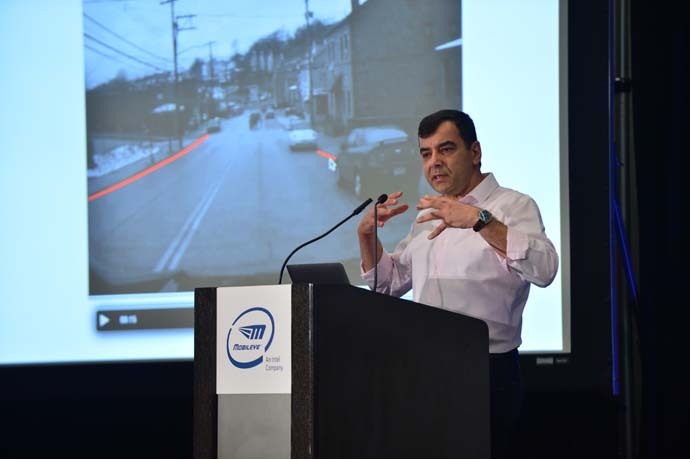 Combined Intel-Mobileye Solution Disclosure: Using a camera-first approach to AV system design, Professor Shashua described a combined Intel-Mobileye platform that is power-performance optimized to enable economically scalable L4/L5 autonomous vehicles. 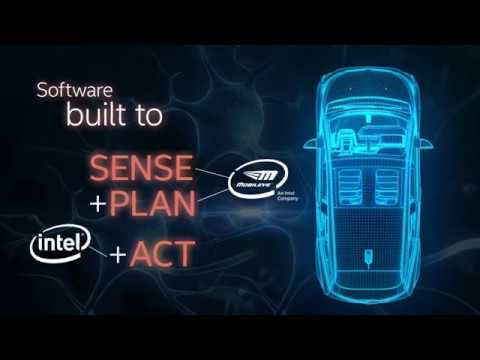 This platform is comprised of two EyeQ5 SoCs, one Intel Atom® C3xx4 processor and Mobileye software. Level 4/5 Partnerships: In parallel to ADAS and L2+/L3 development for consumer-owned vehicles, most automakers are also in the development stages for L4/L5 technology to support fleet-owned networks of fully autonomous vehicles. Today Mobileye announces a new collaboration with large Chinese automaker SAIC* Motor to develop L3/L4/L5 autonomous vehicles as well as bring REM mapping to China. Deep R&D engagements with a number of other major automakers are ongoing and additional announcements are expected soon. Progress in ADAS: Mobileye shipped nearly 9 million chips in 2017 and launched multiple programs including the Audi* A8 L3 system. Thirty new design wins from 27 separate automakers in 2017 ensures Mobileye-powered ADAS solutions will grow substantially beyond the 24 million vehicles already on the road today. Of note: Automaker demand for L2+ and L3 systems gained momentum as a way to go beyond safety and use vehicle automation to provide convenience value to consumers in the near term. NIO*, the first of four automakers expected to launch an EyeQ4-based system this year, recently launched an excellent example. 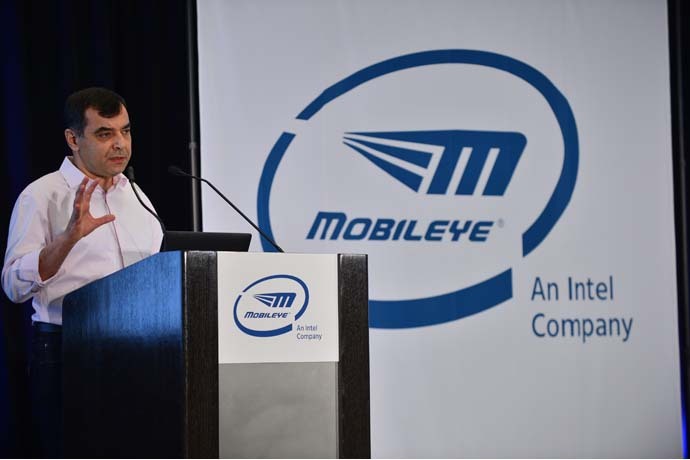 This year, Mobileye will begin collecting Road Experience Management data, enabled by software embedded on EyeQ4, Mobileye’s latest system-on-chip, which began volume production in late 2017. Two million vehicles in multiple regions from BMW, Nissan and Volkswagen will contribute low-bandwidth data packets. This data will be aggregated in the cloud and result in a RoadBook™ of drivable paths, lane/road boundaries and stationary landmarks that are used as reference points. New today: relationships with NavInfo* and SAIC Motor will bring REM to China. The first use of RoadBook will be as a valuable input to L2+ and L3 systems to be launched by several automakers in 2019. The category of L2+ is created by leveraging RoadBook’s low-cost and low-bandwidth footprint (which is crowdsourced through front-facing cameras on millions of L1/L2 ADAS vehicles using only 10 kilobytes of data per 1 kilometer of driving) to enable a major leap in both lateral (i.e., lane keeping support) and longitudinal (i.e., adaptive cruise control) control features at affordable cost. Dynamic Data Collection: REM is not only about mapping. Front-facing cameras on ADAS-equipped vehicles are intelligent agents that can also be used to collect dynamic data, such as road and environmental conditions (hazards, construction, traffic density and weather), infrastructure, and parking availability. Mobileye recently signed a next-step agreement with Volkswagen* to formalize the collection and marketing of this data. Dynamic data can also be collected through Mobileye’s new EyeQ4-based aftermarket product called Mobileye 8 Connect™. 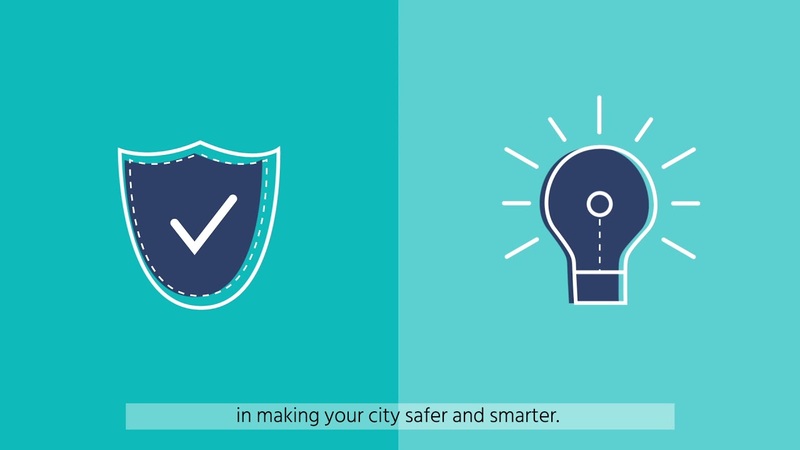 Recent partnerships with the city of Dusseldorf, Spain Directorate-General of Traffic, Gett Taxi Limited, Berkshire Hathaway GUARD Insurance Company, and Buggy TLC Leasing* represent landmark agreements for the use of this data. 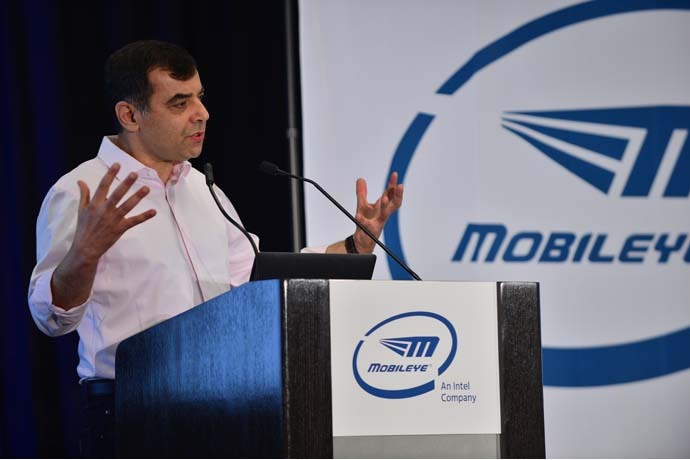 Level 4 Test Fleets: The first car in Mobileye’s 100 vehicle test fleet was shown during Krzanich’s keynote. This fleet will use the development and validation platform described above for a fully integrated Mobileye/Intel solution that Professor Shashua described as “a highly scalable and cost-effective L4/L5 platform, benefiting customers and supplier partners alike.” The fleet will showcase Intel and Mobileye’s full suite of safety-minded and economically scalable software, including surround-view computer vision, crowdsourced REM-based mapping and localization, several levels of sensor fusion, efficient, semantic-based artificial intelligence (AI) for driving policy (decision-making), and a formal safety layer (described below). This will all run on one of the most efficient silicon platforms on the market, which has already benefited greatly from integration of Intel engineering talent since the August 2017 closing. Standards for Safety: Much of the regulatory work to date has focused on fostering the deployment of test fleets, which is a positive development. Now the industry’s stakeholders must come together to prepare the landscape to move from today’s experimental phase to mass production. 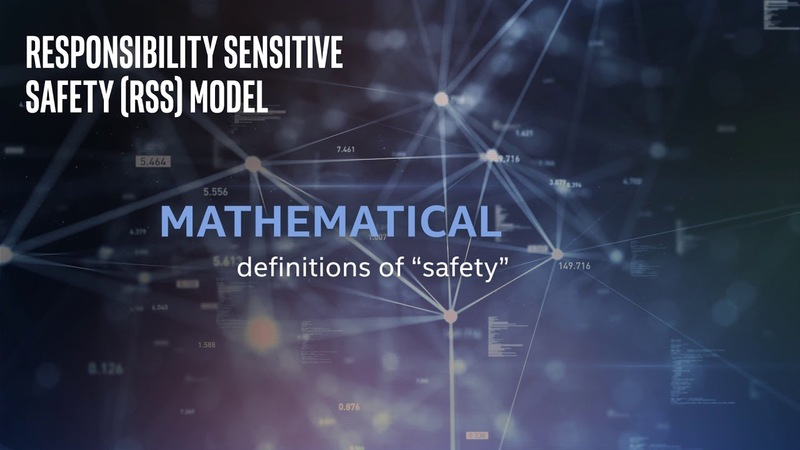 Mobileye took the first step toward an industrywide discussion by publishing a Responsibility Sensitive Safety framework, a set of mathematical definitions to formalize what it means to drive safely.